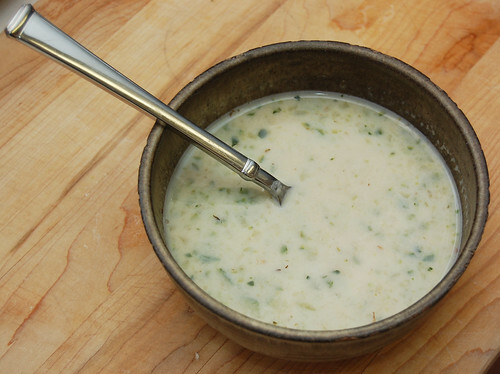 The other day I was browsing Food Gawker for inspiration, and I came across a photo for zucchini soup. This is normally the type of thing that I would quickly skip over, but I remembered that I had a stray zucchini around the house that needed to be used, and not much time left to use it! I talked over a few ideas with Edwin, who was of course thrilled at my newfound fascination with soup. 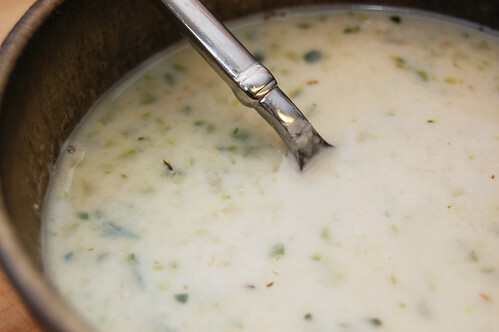 I came up with a few changes to make the zucchini soup I found a little more my style. The biggest change was probably adding white beans. I really enjoy white beans; they always make a really malleable addition to meals. I also some celery, removed the onion and added less zucchini and chicken broth. One thing to keep in mind is to be a little careful handling the zucchini. After chopping it my hands felt completely dried out, itchy, tight and raw. I was initially a little startled, but then I remembered an excellent comment left by a reader on Edwin’s Celery Root Bisque recipe from last year – handling squash can cause a condition called Contact Dermatitis, and zucchini is a squash. It shouldn’t cause any real damage, but if you’re susceptible like me then your hands might be a little uncomfortable right after working with it. Try touching it as little as possible or, if you’re really concerned, wear latex gloves when handling squash. Dry hands aside, I have to admit that I really loved this soup. Zucchini doesn’t really have a very strong flavor, so there’s nothing overpowering about the soup – the white beans and pepper make it flavorful. It’s light, very tasty and quick and easy to make – definitely a DinnerCakes win and a great summer dinner! Heat large pot over medium heat and add oil when hot. Add garlic, zucchini and celery and cook for about 5 minutes, stirring occasionally. Add stock, drained white beans and thyme to the pot, then cover and bring to a boil. 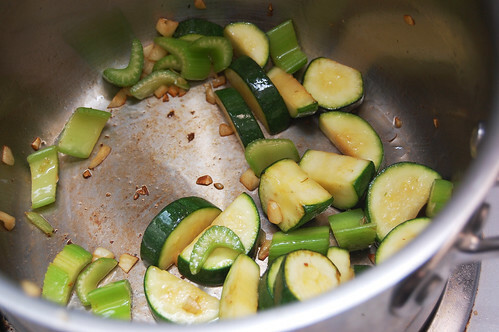 Reduce heat to simmer and cook until zucchini and celery are softened, about 15 minutes. Remove pot from heat and pour in batches of two or three into food processor (be careful not to overflow!) and pulse. When desired consistency is reached, pour final batch back into the pot and add half and half, followed by salt and generous amounts of pepper to taste (don’t skimp on the fresh ground pepper!). Makes about 3 or 4 servings of soup. I've gotten the contact dermatitis thing from squeezing out thawed, frozen chopped spinach before. It freaked me out because I thought I was developing an allergy to spinach.